Today is ANZAC day. "Gemma-Rose, would you like to help me make some ANZAC biscuits?" I ask. Gemma-Rose nods eagerly and helps me get the ingredients out. Soon we're mixing, melting butter and have a brilliant time. "Who'd like a biscuit?" I cry as I pulled them out of the oven, pleased with my success. ANZAC biscuits are a favourite in our house. So today I thought I'd share our recipe for them. 3 tablespoons of rice malt syrup. 3/4 of a cup rolled oats. 3/4 of a cup desiccated coconut. 3/4 of a cup plain flour. 2. In a small saucepan, melt the butter and rice malt syrup, stirring until the mixture starts to bubble. 3. Combine the bicarbonate of soda with the butter mixture. 4. Combine remaining ingredients in a separate bowl. 5. Once the butter mixture has cooled, pour it into the dry ingredients and mix in. 6. Put small balls of mixture onto a tray and flatten with the back of a spoon. 8. Let them cool, then eat! 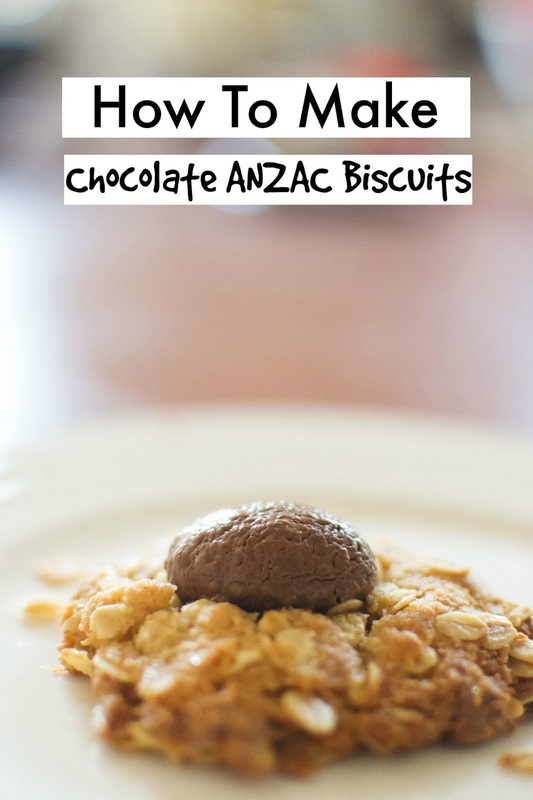 Do you like ANZAC biscuits? What is your favourite kind of biscuit?